In a presentation Monday, Prime Minister Benjamin Netanyahu declared that material Israeli intelligence had taken from Iran proved Tehran was hiding a secret nuclear weapons program, and he called on President Trump to withdraw from the Iran nuclear deal next month. But former CIA Director Michael Hayden tells CBSN's Elaine Quijano, in an interview airing on "Red & Blue" Tuesday night, that what Israel has in its possession just confirms what U.S. intelligence found more than a decade ago. "Late in 2007, we published a controversial National Intelligence Estimate that said Iran had stopped its weaponization program, it was doing other stuff -- the centrifuges, the missiles, and so on." Hayden explained that the U.S. had evidence that Iran had stopped that work in 2003. "This wasn't absence of evidence, he this was evidence of absence -- that they were no longer working on the ... weapons program," Hayden said. And he recalled that U.S. intelligence had called Iran's denials that it was working on a weapons program "a lie," adding, "We always said that although they had stopped this core activity, they kept some other what we called 'dual-use' things under way." The intelligence community concluded at the time that Iran was "at least keeping the option open" of resuming the construction of a specific weapon. So, what Netanyahu has, Hayden says, is documentation that "fill[s] in the story that we and the Israelis had already been telling." Though Hayden has been critical of the Iran nuclear deal, he says, "I don't know that the president can make the nuclear deal better." "Iran is further away from a weapon with this deal than they would be without it," Hayden told Quijano. "And we know more about the Iranian nuclear program with this deal than we would know without it." As a result, the former CIA director says he would be "quite concerned" if in early May, "we rip up the deal and walk away from it." Ahead of talks with North Korea, Hayden is also skeptical that the Korean peninsula will be completely denuclearized. "It would be crazy if they gave up their weapons," he said. "Let me elaborate on that. I use a silly little metaphor. They've gone to the movies. There's a double bill: the first film was called 'Saddam Hussein.' The second film was called 'Moammar Gadhafi.' And the short subject in-between was called 'Ukraine'" -- all countries that gave up nuclear weapons "for territorial guarantees in perpetuity." Kim has seen what happens to those who give up their weapons, and so, Hayden says, "I just find it very hard within any kind of coherent planning timeline we can actually expect to get to zero [nuclear weapons]." And he sought to lower expectations for the anticipated meeting between Mr. Trump and North Korean leader Kim Jong Un. "My sense at the end of the day -- the happy outcome is a good meeting between the two presidents, a little bit more than a photo op that's somewhat ceremonial, and then they launch their two teams knowing that while we've got a lot of work to do, and we put ourselves on a path that reduces tensions and maybe capabilities on both sides and increases transparency," Hayden said. Earlier, on "CBS This Morning," Hayden also suggested that the president may be both too quick to dismiss the efforts of his predecessors to denuclearize the peninsula and in danger of underestimating the North. "You don't need a president saying 'I and I alone' and 'They're still here because other guys were stupid and ineffective,'" he said. "They're still here because they're hard, and they're still going to be here after he leaves in one way or another." 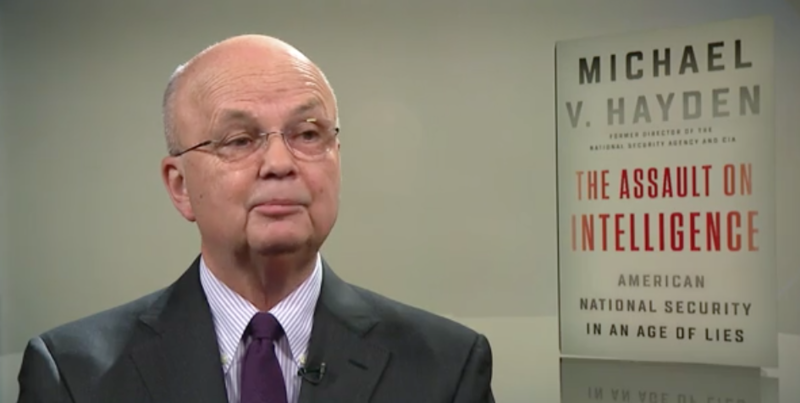 Former CIA Director Michael Hayden has just written a new book called The Assault on Intelligence: American National Security in an Age of Lies. Watch CBSN's "Red & Blue" at 9 p.m. ET Tuesday night for Hayden's full interview.